Hey, everyone! How’s it going? I’m pretty happy that I don’t have to do anything today. I may swing by the library, though. Every grade in my nugget’s school gets a reading assignment for the summer. This year he has to read 4 books and do a report on them by answering questions on summer item shaped pieces of paper and gluing it onto a paper circle wreath. Like on a flip flop shape he’ll say what he would’ve done if he were the main character. Excitement, lol. So once that was all dry, I laid down 2 pieces of striping tape and painted the top and bottom sections of my middle finger with Juliette. Now, normally when I apply vinyls I wait until the next day to be sure I have 100% dry polish. BUT, I was going to Baltimore the next day and needed them done that night. The vinyl is a single heart pattern I got from Twinkled T. Guys, I held my breath and bit my lip as I pulled that nail vinyl off- praying it would not pull my polish up- but the polish gods were smiling upon me that evening as it came off beautifully and left behind a perfect heart using Juliette. So that’s it for today! Hope you all like the nail art! I really need some rose gold polishes in my life. 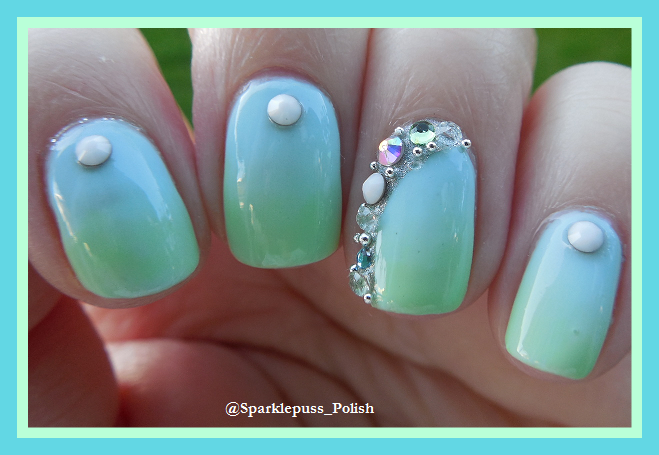 This is one beautiful manicure! This is super cute and such a happy manicure! This is so dang cute! I’m loving this rose gold trend right now. I am wearing a rose gold today, too! Oh man that ILNP is gorgeous! I don’t like metallic polishes all that much, but I absolutely love Juliette! This mani is suuuper cute!